What kind of person is the main character? How do you know? Andreas: Jack is kind of an excited person because he was so happy when he got the three cards that gave him chances to do fun stuff and he got in the hang of writing the obituaries and was very focused and it seemed like he liked the obituaries because he made his own about a deer. He is also freaked out by dead bodies that he sees. Harry: He's hard to describe. A little bit nerdy and has a little bit of a problem being tough. He has a problem with his bloody noses. He's weak and, like me, doesn't want things to be killed. This book really highlights that killing is bad. His dad's quote about being face to face with an enemy and preferring to shake their hand than shoot them is really appropriate. Just like he did. I wish that Cameron could be here to hear this description. Andreas: My favorite character is Jack because it seemed like he was interested with the obituaries. He also let Ms. Volker perform a little "surgery" that he was afraid of. Jack is also taking risks to have fun without his mother watching him. Harry: My favorite character...that's hard to say. I'm going to say that I really like Jack because he's the closest character to me in the story. I really liked Bunny because she's really funny. The way that she acts is what is so funny. She's so small and she's always telling people to toughen up. If there weren't people who were wimpy, there would never be funny stuff in comics. People in the comics would never be able to say "Let's never do THAT again!". And "that was fun, let's do that the next millennium!". 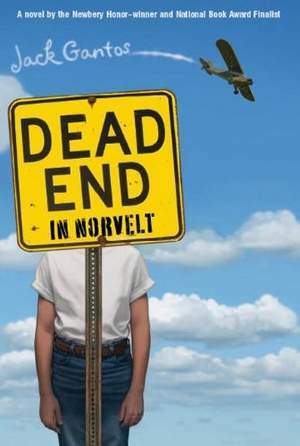 Andreas: The book took place in Norvelt, a small Eleanor Roosevelt town in PA. Without this setting, Ms. Volker wouldn't get her job because Eleanor Roosevelt hired her in Norvelt. Harry: The setting was the most important thing in the story. It was in Norvelt, a dying town and everyone was giving up on it. People didn't think about marrying and staying in the town. Andreas: I thought that this book was perfectly fine. Nothing really scared me at all. There was nothing that I didn't like. Harry: I'm going to tell you when I finish it. Harry: The car was probably one of the only upsides to being grounded because he was able to drive the car. The book, in general, wasn't that exciting. It didn't have enough excitement. The book for the next Book Club meetings is The Hobbit by J.R.R Tolkien.We will be meeting on Wednesday, December 5 and Wednesday, January 2 at 3:00 p.m. to discuss this book. The December meeting will be to talk about our progress, any questions we might have, and to have a little holiday party. In January, we will discuss the book in full.